I came across this picture while cleaning up some folders on my computer this morning. I completely forgot about this recipe! I'm not sure how that happened - it's really good. I made it in the summer, and we really enjoyed it. Thinking about it reminds me of warm weather...something I wish I was enjoying right now. Instead, I'm watching huge snowflakes cover the ground outside. I shouldn't complain, though - it's really pretty. Back to the recipe: it's yummy and healthy...a wonderful combination! I pulled this from the Cooking Light Complete Cookbook (huge thanks to my sister). 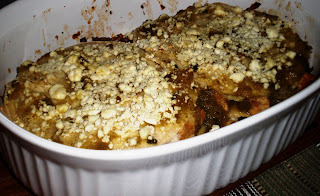 This is a great variation of the normal "rolled" enchiladas - enjoy! 2. Heat oil in a nonstick skillet over medium-high heat. Add onion, saute' 4 minutes or until tender. Add garlic; saute' 1 minute. Combine onion mixture, chicken, salt & pepper. 3. Spread 1/4 cup salsa verde in an 11x7-inch baking dish coated with cooking spray. Arrange 2 tortillas over the sauce; top evenly with half of chicken mixture and 1/2 cup salsa verde. Repeat layers ending with tortillas. Spread remaining salsa over tortillas. Sprinkle with cheese. 4. Bake at 350 degrees for 20 minutes or until thoroughly heated. Cut each tortillas stack in half. Makes 4 servings.